Notaries, Immigration Law firms, Adoption Agencies, Paralegals, Probate Attorneys, CPAs, Companies expanding overseas, Universities, High Schools, call us for friendly, professional service. 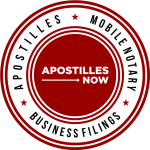 Enhance your suite of services by offering expedited Apostilles. If you are in the LA area, don’t spend half your day battling traffic driving to the Los Angeles Secretary of State, looking for parking, waiting 2 plus hours for your number to be called. If you are in the Bay Area, don’t drive to Sacramento, that is 4-5 hours minimum you could more wisely spend building your business! Don’t use a courier service, that wastes a whole day! Partner with us to get your clients same day service! Send your Apostilles to us. We give your clients’ documents the white glove treatment. Professional, friendly, personal, Same Day Service. We can arrange shipping with your choice of carrier, to your office or client choice of destination. We ship worldwide. Bulk orders get bulk pricing. Please ask for details. Easy ways to pay. Check, money order, PayPal, easy online credit card processing. We keep you updated on important changes at Secretary of State.